In some East Asian countries, a person’s blood type is believed to determine personality traits including temperament and compatibility with others. However, the scientific community dismisses the blood type personality theory, citing a lack of evidence. They say blood types are maintained as a classification system for safe transfusions of blood in emergency situations. Known as the ABO blood group system, different blood types were first discovered by Austrian Physician Karl Landsteiner in 1900. He found that blood sera from different people would clump together when mixed in test tubes, and some human blood agglutinated -- a term for clump in immunology -- with animal blood. The ABO grouping system was officially announced in 1901, comprising A, B and C types. In the following year, AB was additionally found, and C was replaced with O. 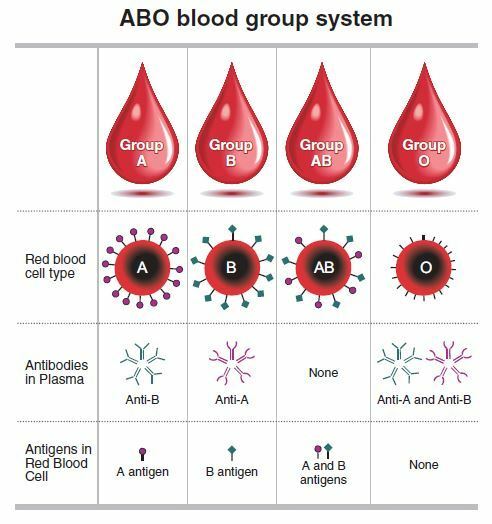 Under the ABO group system, there are eight common blood types and many rare ones. The four major blood groups are A, B, AB and O, determined by the presence or absence of antigens A and B on the surface of red blood cells. Group A has only the A antigen on red cells and B antibody in the plasma. Group B has the B antigen on red cells and the A antibody in the plasma. Group AB has both A and B antigens on red cells but neither A nor B antibodies in the plasma. Group O has neither A nor B antigens on red cells, but both A and B antibodies in the plasma. “However, the exact role of the antigens remains scientifically unproved, which cannot help provide evidence for differences in personalities, body shapes or correlations with diseases by each blood type,” the official said. In addition to the A and B antigens, the protein Rh factor -- found also by Landsteiner in 1940 -- can be either present (+) or absent (-), creating the eight most common blood types: A+, A-, B+, B-, O+, O-, AB+ and AB-. But in recent years, experts are making increasing efforts to find statistical significance in the correlation between each blood type and some critical illnesses and infections. “In 2012, we found that Korean women who have blood type A have 20 percent higher risk of getting stomach cancers than those with other blood types,” said Duck Cho, professor at Samsung Medical Center. Cho embarked on the research at the time based on results that those with blood type A are vulnerable to stomach cancers in Western countries. 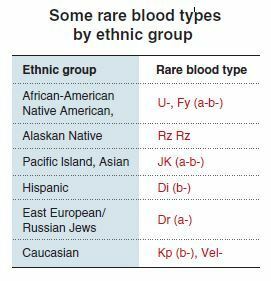 Certain blood types are unique to specific racial and ethnic groups, according to the Red Cross. U-negative and Duffy-negative blood types are known as unique to African-Americans. The Diego-negative type is reportedly found in the Hispanic group, while its positive type is found only among East Asians and Native Americans.